A better understanding of threats to wildlife is possible by using ArcGIS. Spatial analysis of information of wildlife rescue centers helps define specific corrective measures. GIS models a risk prediction map of wildlife threats. One of the aims of the Epidemiology and Environmental Health group from the Center for Animal Health Research (CISA) of the National Institute for Agricultural and Food Research and Technology (INIA) of Spain is to develop research in epidemiology and risk factors for wildlife. Map of prediction of risk of occurrence of vehicle collisions with owls in the study area. Spain is a recognized European biodiversity hot spot, hosting a large number and extraordinary variety of species, especially of birds. Unfortunately, many species are considered threatened at the European level by direct or indirect human impact. Information as to what, where, and how threats produce the most intense damage is the key to adequate management in the conservation of natural areas. However, this information is incomplete and has many gaps. Wildlife Rescue Centers (WRC) play an important role in natural conservation. They recover and care for injured wild animals, promoting conservation and providing valuable information about the health condition of wildlife. This information provides accurate data, giving an environmental indicator of habitat conservation and the presence of threats in an area. This study used WRCs as sentinels of the health status of local wildlife. WRC information (coordinates, species, causes of recovery, date, etc.) was spatially analyzed. For that purpose, ArcGIS software was selected because it includes a wide range of options for spatial analysis and geostatistical tools, allowing users to identify spatial risk patterns of wildlife threats, to explore their association with anthropogenic and environmental features, and to model a risk prediction map of wildlife threats. 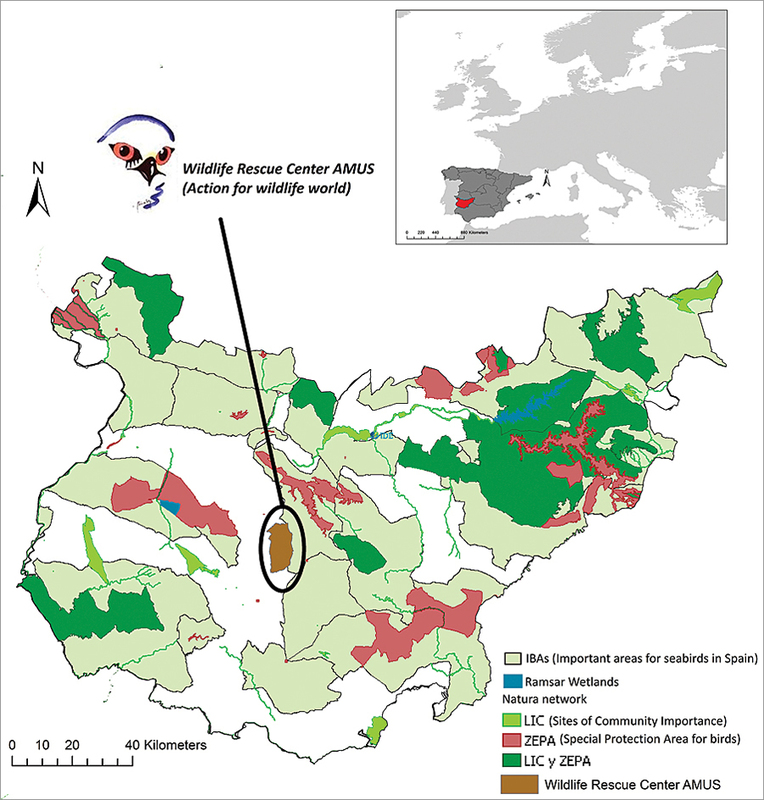 The different protected areas of the Spanish province of Badajoz and where the Wildlife Rescue Center AMUS is located. WRC's Action for Wildlife World (AMUS) is a nongovernmental organization (NGO) located in the Spanish province of Badajoz, which cooperates actively in this project, transferring information about recovered animals (more than 2,000 cases in three years). The analysis was focused on birds because they were the most affected species (96 percent of cases) during the period of study (2009–2013). 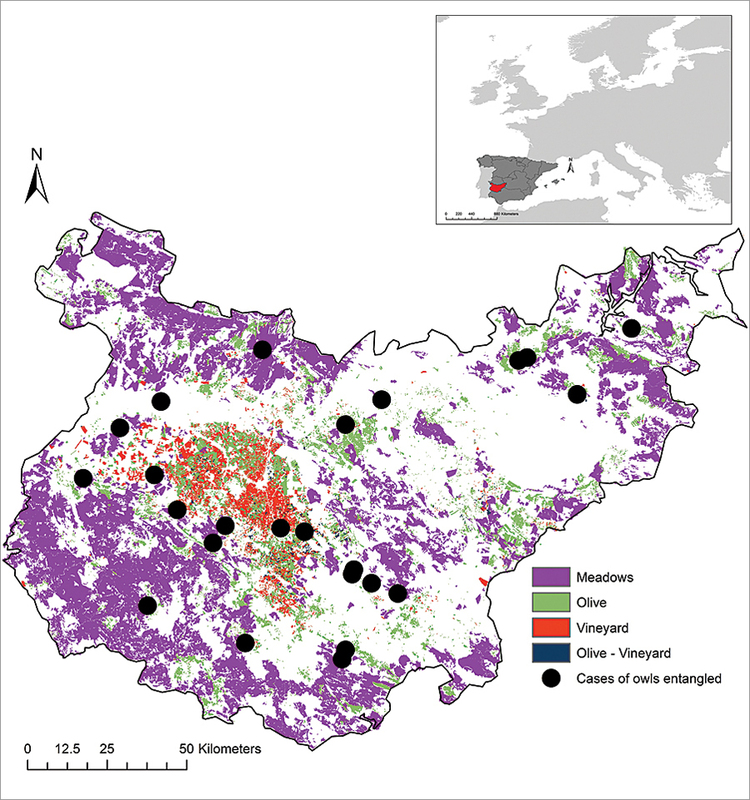 Spatial relationships between location of cases, species, and multiple anthropogenic and environmental variables (land use, vegetation, climatic data, human activities, roads, population density, etc.) have been analyzed to explore their potential association. One of the most significant results shows a heavy association between damages to owls with two anthropogenic causes, that is, vehicle collisions and animals snagged on barbed wire fences. Fatalities in the period of study include 90 birds affected by these threats, most of which were owls (84 percent of cases). Larger species, such as Real Owl (Bubo bubo), cannot avoid impact and subsequent entanglement in fences, being the species with a higher incidence of entanglement in barbed wire fences (57 percent). A relation between owls entangled in barbed wire fences and certain agricultural land use (specifically meadows, which represent 37 percent of cases; vineyards; and olive trees) has been identified. Agricultural land uses associated with cases of owls entangled on barbed wire fences. Most collisions occur when owls fly low over the roads or are blinded by car headlights. 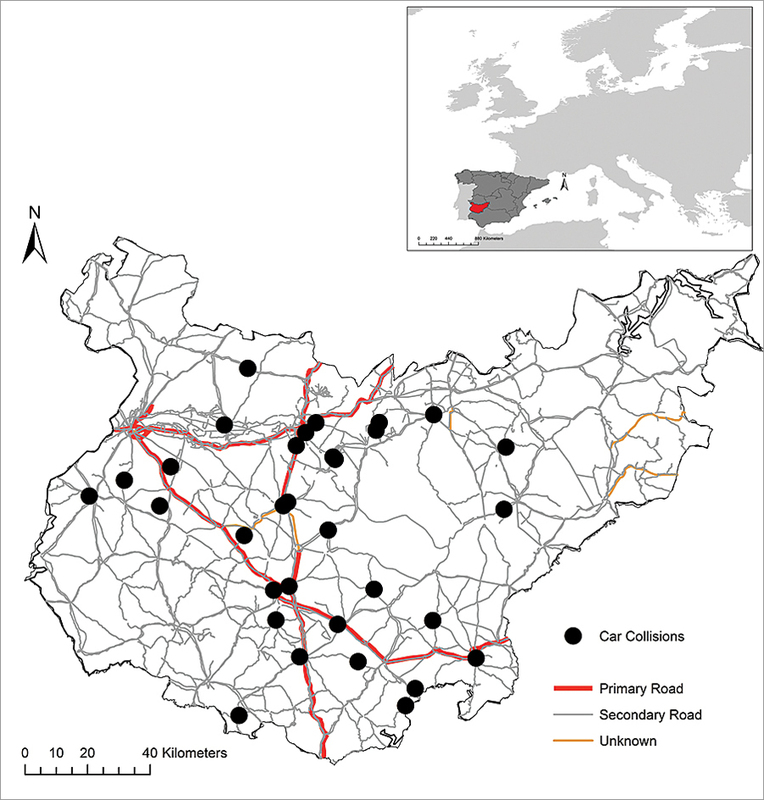 A kernel density analysis of the Badajoz road network was developed and overlapped with cases of vehicle-owl collision fatalities using ArcGIS. Results show a high similarity in the spatial pattern of greater confluence of cases and increased road density. 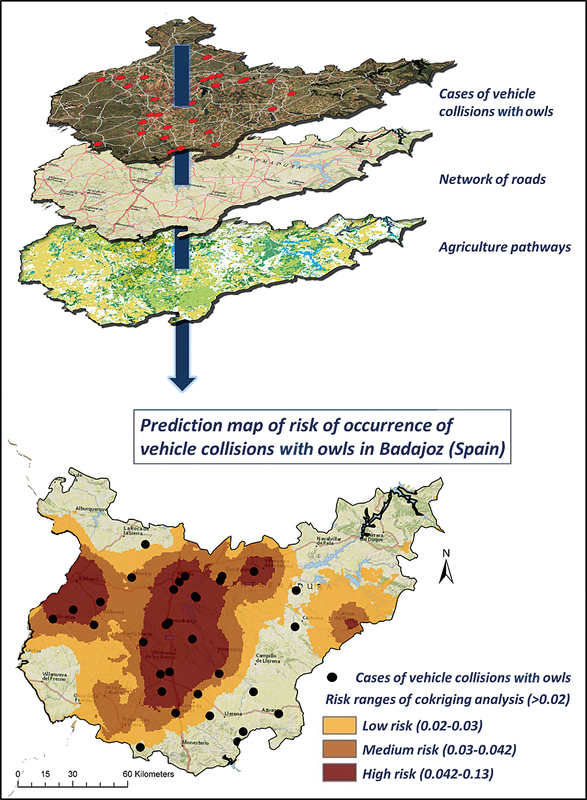 A risk prediction map of vehicle collisions with owls was developed using cokriging analysis (ArcGIS geostatistical tools). 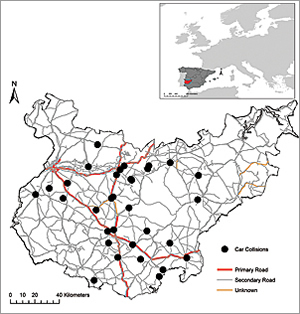 Networks of roads and agriculture paths were used as covariables. The identified areas of greatest risk of car collisions coincide with areas of higher population density and higher roads density. The study showed that the species Little Owl (Athene noctua) has the highest incidence of vehicle collisions (51 percent). This study shows how to use GIS technology to allow a better understanding of threats to wildlife species and their association with human activities. This information would help define specific corrective measures enabling focus and prioritization of environmental conservation resources and management action in those areas where the most affected species are and help to implement the measures. This scheme of study could be transferred to other WRCs to assess specific threats in specific areas and species through this passive surveillance of incidence of threats to wildlife. Owls affected by vehicle collision in the Spanish province of Badajoz. Epidemiology of animal infectious diseases mainly focusing on environmental parameters as risk factors and wildlife as disease reservoirs. Spatial analysis of the introduction and spread of diseases. Advances in the diagnosis of emerging diseases and those shared by wild and domestic animals. Environmental impact assessment of veterinary medicines. For more information, contact Dra. María Jesús Muñoz Reoyo, head, Group of Epidemiology and Environmental Health, and Dra. Irene Iglesias Martín, GIS specialist and wildlife veterinary epidemiologist (e-mail: irene_iglesias@yahoo.es and iglesias@inia.es). More information about CISA-INIA. More information about WRC's AMUS. Part of this work was financially supported by Foundation MAPFRE.